For some people, Valentine's Day is the best day of the year because it is when you get to show the world and, more importantly, your significant other just how much they mean to you. For some, however, it is also the day that brings them the most anxiety. The question that plagues everyone's mind every year is, "What am I going to do?" Do not fret! Although it may seem cliché, Disneyland is the perfect place to go if you want to treat your significant other to a day they won't forget. From the moment you step through those turnstiles, it's clear to see that love is in the air at Disneyland. The lawn in front of the Disneyland Railroad has been transformed with vibrant pink hearts providing the perfect backdrop for those Valentine's Day Instagram pictures. If you can't seem to get a picture without other people in it, head into the park for an even better photo opportunity. Right at the start of Main Street, there are two huge hearts bordered with flowers. Reminiscent of Brach's candy hearts, these giant hearts are the best place to get a picture-perfect shot without having to fight people for it. Now that you have all the pictures you need, head into the park to see what new and exciting food the park has to offer. Are you a fan of the churros? Then make sure to try the chocolate cinnamon churro with spicy, chocolate dipping sauce. It is the perfect on-the-go treat. If you want to sit and share a dessert, then head to the Gibson Girl Ice Cream Parlor for the Sweetheart Donut Sundae. It has a scoop of vanilla ice cream covered in decadent chocolate sauce, whip cream and a cherry on top paired perfectly with a chocolate-frosted chocolate donut. It is just big enough to satisfy that sweets craving, without overwhelming you in sugar. 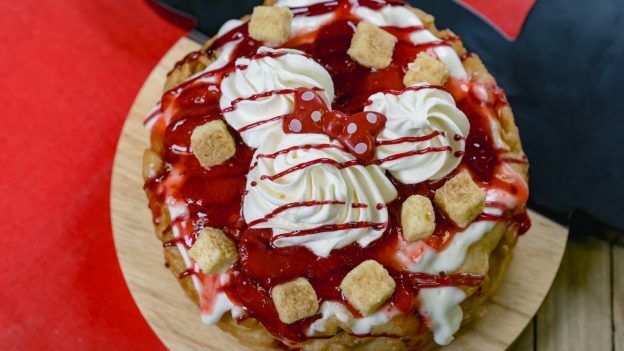 If these don't satisfy your sweet tooth, then the strawberry cheesecake Funnel of Love funnel cake at the Stage Door Cafe is the dessert for you. It is huge and does not play around with its sugar content. All that food can have you feeling pretty full. The perfect activity to help work off that food is Minnie's Valentine's Day Surprise Scavenger Hunt. At $6.99, this activity is perfect for those who love spotting hidden Mickeys and want to stroll through the park for a while. Once completed, head to the Disney Showcase for a surprise reward of a pack of cards that comes in two different styles to choose from. Although the castle is closed for the time being, the fireworks are still the best way to end the night. Stand between the train station and central plaza on Main Street USA to get the best view. You can celebrate your love while watching an array of fireworks light up the sky. Even if you are a frequent guest to the park, Valentine's Day at Disneyland is a special experience that can't be missed. Show your significant other just how much you love them this year at the Disneyland Resort, you won't regret it.